Santa Muerte, a folk saint so little known before the turn of the century—in a religious landscape mostly populated by centuries-old figures—has become widely present in the Mexican public sphere in the past few years and, just as quickly, has been associated with criminality and drug violence in the media. This association has depicted Santa Muerte’s followers not only as criminals themselves, 1 but also as engaging in illegitimate, even blasphemous, 2 devotional practices. While this mass-mediated association resonates with old, Porfirian-age and ultimately colonial discourses linking Mexican lower classes to criminality 3—which of course, says more about class hierarchies in Mexican society than about Santa Muerte devotees themselves—I consider there to be, indeed, a relation between this saint and violence that remains unexplored. 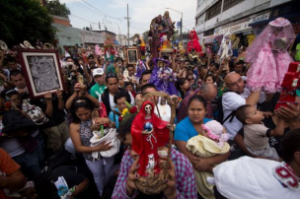 By examining a collective ritual that takes place in Santa Muerte’s main shrine in the downtown slum of Tepito, Mexico City, I wish to explore one of the ways in which such a relation plays out. Tepito is a neighborhood best known for its massive informal market—where, allegedly, one can buy commodities of all imaginable kinds—but is also remarkable for its strong communal identity, which claims a pre-Hispanic past and which was able to resist gentrification efforts by the local government 4. It seems to have harshly felt the well-known effects of neoliberalism: unprecedented flows of money (especially of illegal trades), greater inequality, harsher capitalist competition, and the violence this brings about. The practices surrounding Santa Muerte, I argue, are means through which this violence is collectively acknowledged, evaluated and addressed, while offering a space by which the community of devotees reminds itself of such a fact and (ritually) reconstructs social bonds, which are crucial for both collective and individual survival. On the first day of the month, devotees gather around the Santa Muerte shrine well before the main ceremony. Many are seen close to their Santa Muerte icons, either because they are holding them in their arms [image 1] or because they have placed them over a piece of cloth on the floor, like small, improvised shrines [image 2]. All sorts of small objects—candies, toy bills, beaded bracelets—can be seen in people’s hands or adorning their statuettes. The objects are gifts brought and distributed by devotees in return for miracles granted by Santa Muerte. As has become customary, devotees bring many such objects, which indicates the magnitude of the intended repayment. Devotees will offer them as gifts to several of the numerous Santa Muerte statuettes gathered on that day—insofar as all are equally indexes of the same Santa Muerte. While offering the saint her gratitude, however, it becomes unclear whether the recipient of the gift is Santa Muerte or (also) the devotee carrying the icon. Moreover, the gift is usually accompanied by a que te cuide y te proteja, “may she look after and protect you”, whose target is clearly a fellow devotee. In this way, the gift giver is demonstrating Santa Muerte’s efficacy to the recipient and encouraging others to engage in or maintain relations with her. As anthropologist Timothy Knowlton shows for a similar ritual, [5. Timothy Knowlton, “Inscribing the Miraculous Place: Writing and Ritual Communication in the Chapel of a Guatemalan Popular Saint”, Linguistic Anthropology, 25(3), December 2015] these individual communicative acts, superimposed on each other—as can be seen in the accumulation of gifts adorning the statuettes [image 1]—constitute and help sustain this collective devotion overtime. But there is more to this. Gift giving, one of the classical concerns in anthropology, has been found to be at the very foundation of sociality, as acts that inaugurate (or, in our case, reestablish) social bonds and that carry the obligation to reciprocate. Following Nancy Munn, 5 a gift may initiate a reciprocal transaction, and thus a social bond—a connection between the two persons involved where the gift giver is constituted and remembered as a generous person and her action reciprocated through a return gift sometime in the future. This logic of reciprocity, although inverted, appears in devotional practices through which Santa Muerte followers attempt to harm others, to retaliate against others’ abuses of power or to counteract a competitor’s conspicuous economic success, situations that have become increasingly common, as mentioned, in recent years. 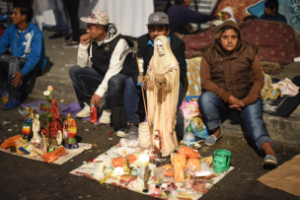 The possibility to engage in these harmful practices, however, comes with a warning: Santa Muerte takes a loved one if a devotee fails to repay a favor. In other words, Santa Muerte takes revenge by mirroring the devotee’s harmful act, and thus breaking this devotee’s network of social bonds in the same way that she mirrors a devotee’s thankful repayment by creating a new social bond through gift giving, as the ritual above describes. Knowledge about Santa Muerte’s revengefulness, for devotees, is thus a recurrent reminder about the perils of destroying social relations. Communal ritual practices not only result from the collective acknowledgment that a network of friends and kin is fundamental for everyday survival—especially in communities that have faced the hardships of poverty 6—but also that violence is ultimately unsustainable for social life. Santa Muerte followers then gather once a month in order to ritually suture back these severed bonds. In this way, the community becomes an agent that sustains itself into the future.